LONDON--(BUSINESS WIRE)--Technavio market research analysts forecast the global submerged arc welding market to post a CAGR of close to 4% during the forecast period. The advent of new technologies driven by competitive landscape is a key emerging trend that will impact market growth. Technological innovations and advances both in terms of equipment as well as methodologies are clear indications of the highly competitive landscape in the global welding industry. Most welding equipment manufacturers are focusing on adopting two key technologies, which include welding automation and welding information management systems, to increase their capital budget and reduce their operating costs. The increase in construction activities across the globe is expected to drive the demand for the submerged arc welding market, both in terms of equipment as well as consumables. The construction industry extensively uses structural steel for building structures. Structural steel is an important raw material for all construction activities, and its application is imperative. With technological advances leading to new steel applications, it has become important for the submerged arc welding market to upgrade its technology and meet the new requirements. This market research report segments the global submerged arc welding market based on end-users (automotive, construction, aerospace and defense, shipbuilding, and others) and by key regions (the Americas, APAC, and EMEA). In 2017, the automotive segment accounted for the major share of the market, followed by the construction, aerospace and defense, shipbuilding, and others. The shipbuilding segment is expected to exhibit the maximum growth in its market share over the forecast period. APAC dominated the global submerged arc welding market in 2017, accounting for a revenue share of more than 46%. The market in this region is expected to grow further owing to the focus on infrastructure development in the region. APAC was followed by the Americas and EMEA. 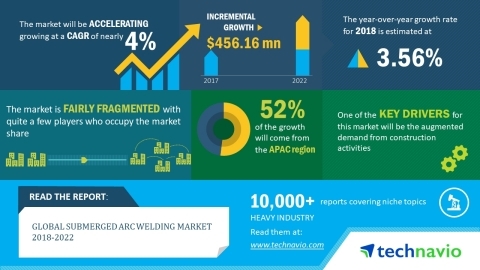 Technavio market research analysts forecast the global submerged arc welding market to post a CAGR of close to 4% during the period 2018-2022.